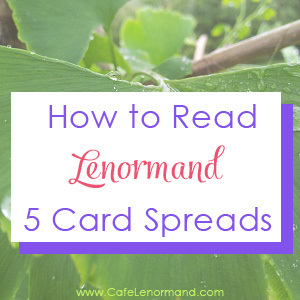 The Lenormand 5 card spread is a simple, fast spread that provides a detailed and thorough answer to your question. Similar to the Lenormand 3 card spread, it is a linear spread that is read from left to right. The central card (see diagram below) acts as a focus for the spread, giving you the overall theme to the spread, with the other cards filling in the blanks. The Lenormand 5 card spread can give you insight into a situation, advice on what you should do, or even predict the the new future. While it doesn't provide the same breadth of information as a Grand Tableau, it does give more information than a 3 card spread. 1. Shuffle the cards while concentrating on your issue and question. 3. Draw a card from the top of the deck and place it on the table. Draw another card from the top of the deck and place it to the right of the first card. Continue until you have 5 cards laid out (see diagram above). 4. The central card (Card 3) provides the overall theme or message of the spread. 5. Card 1, 2, 4, and 5 are read individually. 6. All 5 cards are read together to tell a story. 7. Cards 1 and 5 and cards 2 and 4 are read in combination. This is called mirroring. This is a spread from a reading I did for a friend. The Lenormand Clouds is the central card in the spread. It carries more weight than the other cards in the spread. The Clouds represent uncertainties, problems, and lack of clarity. This points to me that A is unsure about what she needs to do to grow her business. She has uncertainties about the overall business and the direction to take it in. It could also indicate that she doesn't feel aligned with her business. Looking at the first card, we have the Lenormand Tower. This card represents self-employment and business. It confirms that the reading is addressing the question asked. The Lenormand Key emphasizes the idea of a successful business and growth. The Lenormand Lily represents maturity and taking your time. It indicates that A has the skills and expertise to grow her business, but it's going to take some time. It's a reminder to have a balanced life, to take some time to rest and to not be a workaholic. It could also point to a mentor who can help A grow her business. The Lenormand Stars is a wonderful card to see here. It shows that success is at hand. A is on the right path and is being guided to the prosperous business she desires. She needs to trust her intuition and follow the guidance she receives. Tower + Key indicates business success. It tells us that the cards are answering the question asked, and it shows that A can grow her business and be successful. Key + Clouds shows that success is uncertain. The Key is to the left of the Clouds revealing that things aren't clear right now. They're in a state of fluctuation that isn't allowing the business to grow rapidly. Clouds + Lily indicates that once things clear up, there will be a period that's more stable which will allow A to use her experience and knowledge to grow the business. Getting away for a bit for some needed rest can also help A to have more clarity about how to grow her business. Lily + Stars represent that A will grow her business successfully. She's in a bit of a holding pattern right now making slow progress, but she will get there. She needs to be patient and remember that she has the experience and know-how to make it work. It can also indicate that a mentor can help her achieve success more quickly. Tower + Stars – here, we have another indication of A successfully growing her business. This spread tells us multiple times that she will have the success she wants. She's nearly there. Key + Lily suggests a mentor can help her. He might be the key to her success. Summary: Overall, A growing her business isn't about any one set activity that she can do. Growing her business will be based on her skills, wisdom and experience. She already has what she needs to be successful. She just needs to be patient, and perhaps consider taking a vacation to allow her to rest and regroup so that she can tackle the task ahead of her with fresh eyes and a renewed sense of purpose. If she can find someone to mentor her, she can achieve success more quickly. Feedback: When I shared the reading with A, she informed that she was feeling burned out with her business. She knew she could make it successful, but she was tired and wanted to get away from it for a few months, but didn't think she could do so. She wasn't certain whether she could keep going forward with it as tired as she was, but she didn't know what her options were. She had thought of asking people close to her for help, and would look into it more. The spread I used in the example conveys a bit less detailed information than most 5 card spreads. It also repeats itself a few times. However, I chose it as an example, not just to illustrate the steps involved in a reading a 5 card spread, but also to show how simple an answer can be at times…and how to read a spread that appears challenging at first glance. When I first laid the cards and saw the Clouds as the central card, I wasn't too thrilled. I was unsure as to whether the cards were answering the question or if it was even possible to know what A could do to grow her business. However, as I read the 5 card spread, the meaning of the Clouds became clear, and the spread was easy-to-read. If you ever have trouble reading a Lenormand 5 card spread, or any spread, just start at the beginning and work your way through the steps one-by-one. Your website is fantastic! Thanks a lot! Regarding the 5 card spread, is it possible that cards 1 and 2 represent the past and 4 and 5, the future? Traditionally, no. If you use Steinbach’s method, they can. However, it’s widely recognized that her method doesn’t give as detailed of an answer. I love playing with my Lenormand deck and typically stick to the 3 card spread. I found your website to learn a new spread and it was pretty cool, but confusing! My question relates to what the rest of this year holds as far as my love life. I got Stars, Ring, Heart, Cross, House. The Cross is totally throwing me!! Thoughts?? Had my first Lenormand 5 card spread reading today. I have to admit, I’m now totally depressed. it had to be the most gloom and doom reading I ever had in my life. cards were whip, mice, woman, tower and coffin….the question was regarding business. feel like giving up now . I don’t know who you had your reading with, but you should try to use the advice you received from the cards to motivate you to make any changes you need. Spreads can be worse. This is so great! I just started using lennies and I came across this page. I had no idea you could use mirroring or adding all the meanings up to create such a thorough reading with these cards. Thanks for teaching me something new! Central card: stork-he is going to make a change. clouds book he is anxious about his secret. book child definetely secret about child. Hello, plz help me know the meanings 5 cards I get with my question: Whether I have happy ending with my boyfriend? 5 cards I got: Tower – Gentlemen – Whip – Fox – Sun. Hi Ti, Have you tried using the instructions above on how to read a 5 card spread? How would you interpret your cards according to the instructions? Yah, I know. But I wonder that Whip means there has problems between us, I know, we have just broken up. Howerever, I dont know to understand deeply the Fox card – that means he will change his mind, more clever, more cunning in order to get the succeed; then the Fox indicates him or another person come after him??? Hey there! I am relatively new to Lenormand and I asked my deck if I would get back together with someone from my past who has been reconecting with me. In the 5 card spread I got the ship, child, tower, bouquet and lily. Would you mind helping me interpret?